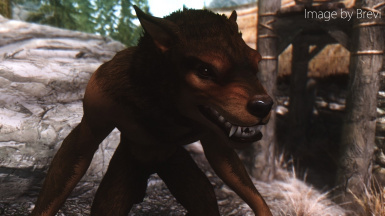 HD werewolf texture replacer for Vanilla based werewolves. AV pack, Replacer version, Moonlight Tales Essentials patch. Compatible with La Femme Lycana by MadCat221 and The Howling by Brevi. 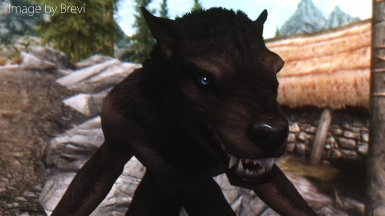 Choose a race based werewolf skin colour to suit your Player Character. Please contatct me before using the assets contained in this mod for any other purpose. I will not allow any part of this mod to be sold, and ask that you notify me before you intend to use any part of this mod for your own work. 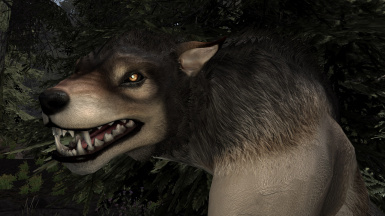 Brevi (spwnd), Al99 and NsJones for making Moonlight tales and special thanks to Brevi for making the patch and contributing awesome images of the werewolves! 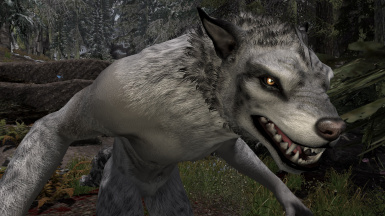 This mod includes 11 different HD textures for for vanilla based werewolf meshes. Works with both The howling' and 'La Femme Lycana' (Not compatible with Apex Werewolf). 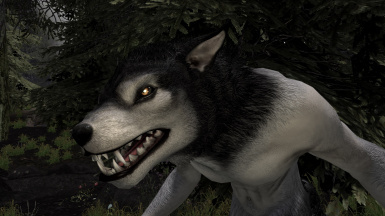 Packs available on DL page for both Automatic Variants and Moonlight Tales - Werewolf Essentials. 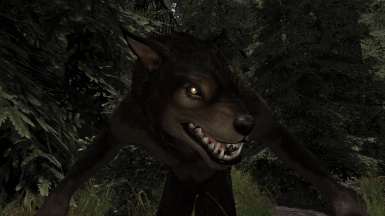 These textures aim to bring a little bit of the 'humanoid' side of the werewolf out, by allowing some racial traits of the player character to show through while in beast form. 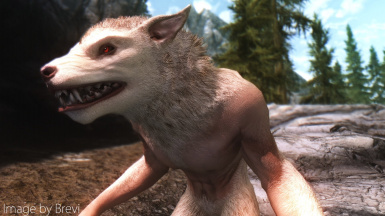 There is a texture for each default Skyrim race plus Albino and Husky colours, though do feel free to choose any you like for your Character! 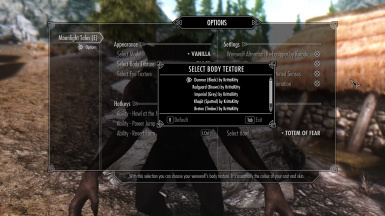 Unfortunately This mod doesn't yet assign these textures to each specific race, but if you have experience with scripting for Skyrim and want to offer to write a mod that does, I'd love to hear from you! 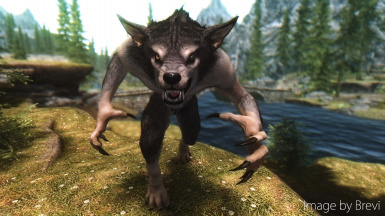 For now you can use these textures as just a normal vanilla replacer (All your werewolves will look the same), or part of Moonlight tales and/or Automatic Variants. Blue, Red, Brown, Gold, Green, Albino, Nautral. * MTE pack does not include ALL the coat colours (since that would require epic amounts of scripting edits to MTE) but if you have to have one you can easily download the loose files version and just manually overwrite which ever MTE texture files you dont like. When making these textures I chose to keep the vanilla fur patterns allowing more of the 'skin' to show. I won't be making a fully fur covered version since both Bellyache and Alienslof both already have fantastic full fur versions available. This mod WILL replace your vanilla mesh with an edited vanilla mesh with the correct settings. 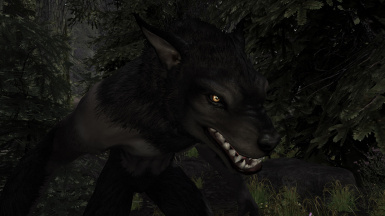 In order for these textures to look their best I have altered the 'glossiness' settings in the werewolf .nif. 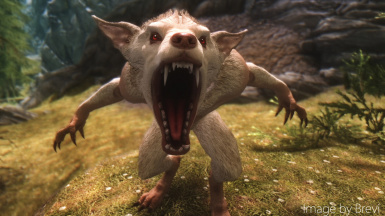 Bethesda had the head, chest and arm sections of the mesh all set with DIFFERENT glossiness values, which created icky seams on the body when you dont use their existing textures. If you use a custom mesh, make sure you back up your existing mesh and alter the shaders as described below in the compatibility section! I have not included an edited version of the 'la Femme Lycana' mesh, mainy because I havent contacted the author for permission to re-distribute the mesh. The MTE version though does include this editedmesh, since it is part of the MTE mod. If you would like to use that version of the La Femme mesh, you will still need to change the texture paths in the nif, otherwise it wont work. Download the MTE version (it works with BOTH moonlight tales mods) just choose either 1k or 2k. Download the replacer version, either 1k or 2k. You dont need any other files other than the replacer. Please be aware you CAN use all three different type of pack at the same time! So you can use MTE, Automatic Variants and the replacer version. I recommend backing up your existing werewolf files and save games before installing, just as a precaution! Download and run with Mod manager of your choice. Allow files to overwrite existing textures and meshes. Download installer version, navigate to the files of your choice and copy into correct location in your skyrim folder. Make sure you also install one of the meshes or edit your existing one as mentioned below, other wise you will get seams! Download manually or with NMM, install to correct skyrim folder location. Run skyproc patcher, enable 'KrittaKitty HD Werewolves'. 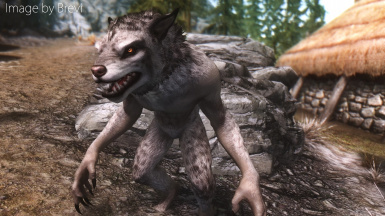 Disable any textures you do not want appearing in your game and make sure that you disable other werewolf texture packs which will look odd with the new shader settings on the body. Don't forget to install the meshes!! 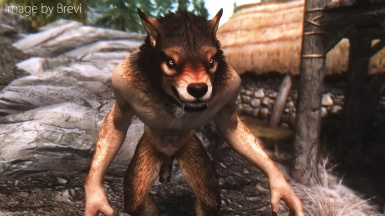 Pick either vanilla or the Howling from the download page and install either manually or with NMM, otherwise your werewolves will look silly! Install Moonlight tales FIRST! Then install this pack either manually or using a mod manager of your choice, allow all files to be overwritten. 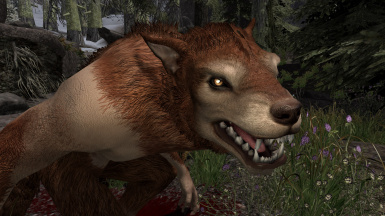 This mod should be fine with most werewolf mods as these only replace textures and there is no .esp or .esm involved (MTE patch excluded). 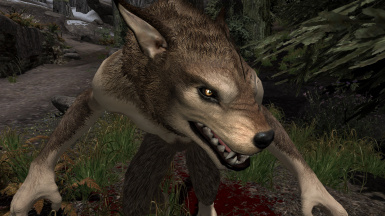 Make sure you load AFTER any other werewolf texture replacers. 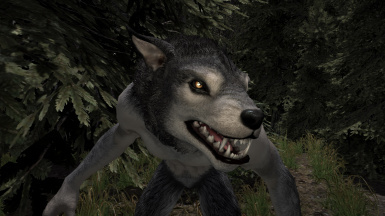 If you use Automatic Variants, make sure you disable other werewolf textures since they will probably look bad (super shiny with seams on the chest) because of the edited shaders in the meshes included with this mod. Also disable the 'catseye' texture, since it seems corupted from the compression program I used to batch process the textures. shouldnt' affect gameplay. 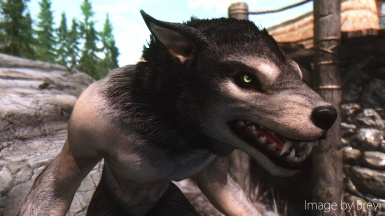 if you did want the cats eye effect you can always just copy your original vanilla werewolf texture and replace the one in the AV pack with the vanilla one. Works just fine with Moonlight tales FULL version. 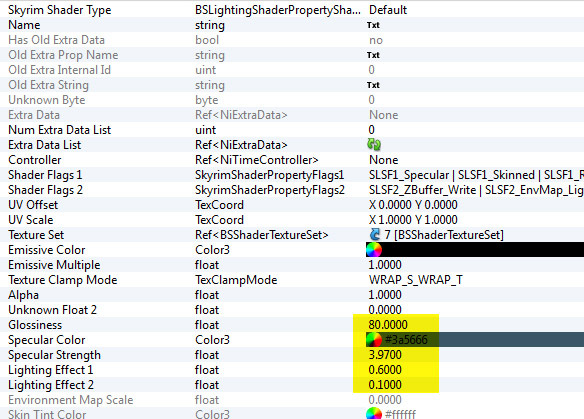 Install with NMM or drag contents of mod into your skyrim folder. replacer or you will get a body texture glitch. 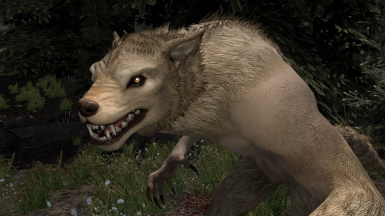 If you use the 'La Femme' body, or any mod which uses more than one mesh for werewolves (such as some of the ones which add both males and females, or add 'parts' to the werewolves, I recommend MANUAL install only since the mesh files included wont install correctly. 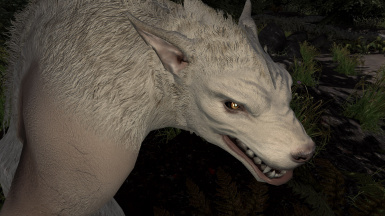 Also these 'other' meshes will have incompatible shader settings which will cause overly shiny textures and seams on your werewolves. Brevi (spwnd), Al99 and NsJones for making Moonlight tales, and Moonlight Tales -Werewolf Essentials. 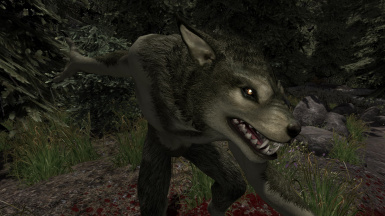 A special thanks to Brevi for making the patch, The howling mesh and contributing awesome images of the werewolves!